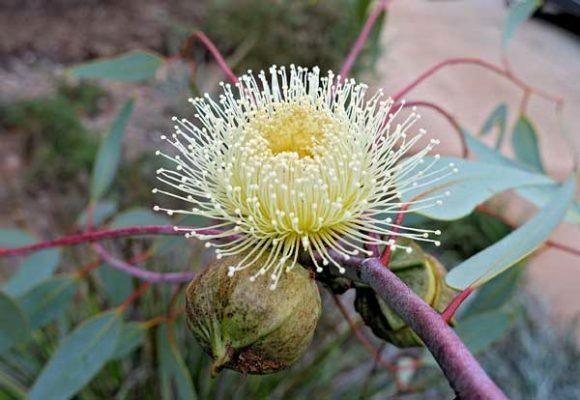 What is so special about Western Australia’s wildflowers? There are more than 12,000 different types of wildflowers listed in the flora catalogue for the state. There are many more yet to be discovered and others already known yet to be given names. Botanists working on the flora can expect to find several new species each year. Climate. Hot dry summers with cool wet winters provide challenges to which plants have adapted in various way. See more about the unusual reasons for this amazing biodiversity in this video from the Kwongan Foundation. Our wildflowers are also well-known for ‘putting on a show’ Every spring each species tries to outdo the others in a competition for pollinators. Many differing pollinating agents are used. Birds are important, and bird-pollinated flowers are large, often red, and have robust stems to provide purchase. The plant gets a double benefit in that most of our honey eaters are also insectivorous. Some plants avoid the competition by developing specific pollination mechanisms. For example, some orchids, have evolved bizarre schemes such as tricking wasps to think they are copulating with a female wasp. There are many other examples of plants adapted to specific insects, often a species of native bee, and the insect relying on that plant as its food source so they become mutually dependent. Other plants opt to avoid the pollination race by flowering at other times of the year, thus also providing year round food for pollinators. llyarrie (Eucalyptus erythrocorys) shows many of the typical characteristics – large showy flowers with bright red bud caps, presumably to attract the attention of birds. It flowers in mid summer.